EXISTENCE ESTABLISHMENT » Propergol – Tormentor 7"
Here is an incredible release from one of the driving forces in modern noise and industrial. Released on the classic label Nuit et Bruillard this release is 100% pro. The packaging looks great, good thick vinyl, and insert with art and info is all that I could have asked for. The two tracks on this release are similar which make for a great pairing. Side A sees Tormentor to fruition with a pulsating rhythmic synth blast and swashes of noise meticulously layered over everything. It’s a great mix and makes for an almost catchy but also pummeling delivery. I Need You is on side B and things time things are drenched with more layered distorted levels. There is still a ryhtmic backdrop which is not lost and it helps hold the track together. The production on this is just pristine in every way. With an extremely punchy edge to the recording the sound hits hard and viscerally. 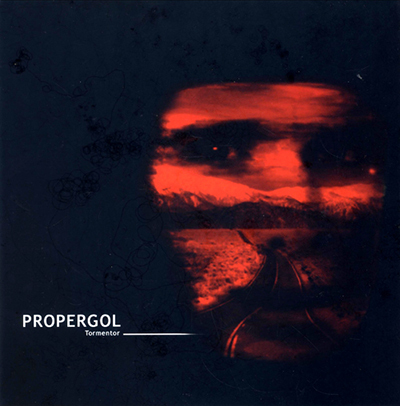 Propergol has the layers carefully separated within the composition which allows them the spectral space they inherit. Clear highs, seering mids, and brutal lows make the sound here very effective and insure that each element is heard and can be focused on. This is not only a great release from Propergol but in comparison to many noise releaeses this is top teir material. An excellent showing of visceral and technical skills and results. Highly recommended.